"Terrible card. Nobody plays it. OVERRATED! Sad." I assume this counts as one "attack action" and thus only the first of its 3 attacks will get the Ranged +1 bonus for Hawkeye, Steep Hill, etc (despite not officially being "Sweeping"). Still, if your Wizard is running Hawkeye and a Steep Hill anyway (and probably Gloves of Skill, too), you can get 4 dice of Unavoidable, Critical, Ethereal damage on the first attack at Range 0-1 for 6 mana and a full action (to be followed up with an Arcane Zap, of course) - which is nothing to sneeze at. I'm not aware of any other way to get such a powerful Critical attack. * The 2-dice attacks at up to 2 other targets is a bonus. Of course, the (Air) Wizard isn't exactly hurting for Ethereal attack spells. Just trying to figure out a way to use this highly thematic spell. * I guess it's technically possible to put Maim Wings and Hawkeye on your Psylok that's perched on a Steep Hill... then find a way to lure your opponent into Range 0-0. LOL. Screaming Zombie can't take Hawkeye, so that won't work. Ranged +X doesn't work on zone attacks, so Oscuda's out of luck. Even with all the tricks above, a Screech Harpy could only get up to 3 dice for its Unavoidable+Critical+Ethereal attack. If only there were a way to give a creature "Poison +1" before pushing it through Wall of Poison Gas!! 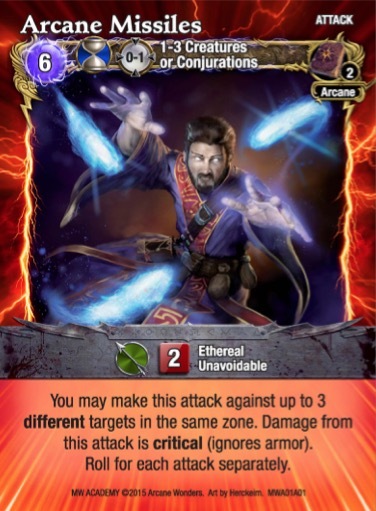 *edit* Also, if your Hawkeye Wizard is perched on a Steep Hill, and also has Lightning Ring, he's already hurling 6-dice Lightning Jolt (4 mana quick-cast)/Arc Lightining (5 QC), 7-dice Piercing Thunderstrike (6 QC), 8-dice Lightning Bolt (8 QC), or 9-dice Thunderbolt (10 FC). So 4+2+2 FC Arcane Missiles aren't really overwhelming except against a very highly armored opponent (or Resilient Zombie swarm...).